Place chicken breasts into a re-sealable gallon-sized plastic bag. Mix together tequila, lime juice, zest, garlic, cumin and salt. Reserve 1/4 cup of the marinade, refrigerating until needed. Pour the remainder over chicken breasts. Allow chicken to marinate in the refrigerator for a minimum of ½ hour and up to 2 hours. Take chicken breasts out of the refrigerator and drain marinade ½ hour before grilling. Dry chicken breasts with a paper towel to encourage browning. When you are ready to grill the chicken, create melt butter in a small saucepan over medium low heat. When butter is melted, add reserved marinade and stir to combine until heated through. Set aside. Heat grill to medium-high heat. 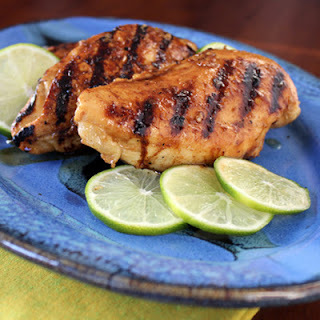 Grill chicken for 5-6 minutes on each side or until the chicken reaches an internal temperature of 165 degrees F, brushing with butter mixture as the chicken cooks. Anne - We're so glad you had the opportunity to make it! If we can ask, how did you serve it? Plain, with my sweet potato sweetie packs (http://blog.engineeringdinner.com/2013/05/sweet-potato-sweetie-packs-for-campfire.html). I did use the leftovers in a salad, and that was really good!